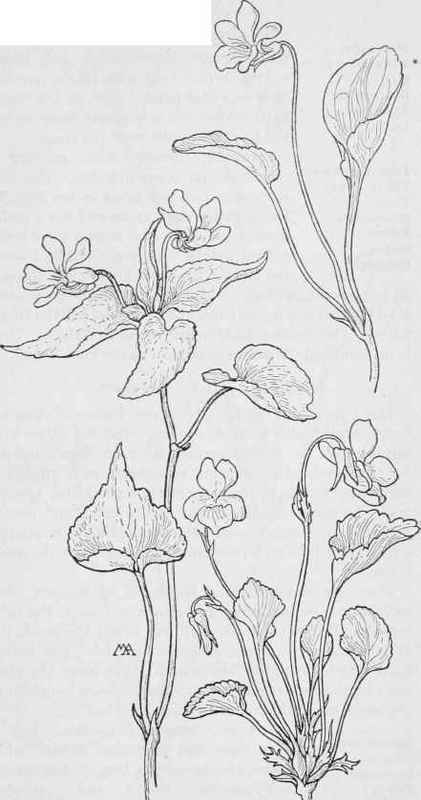 This is small and low, about three inches high, with leafy stems, forming a clump of small, smooth, more or less toothed leaves, with blunt tips, dark green on the upper side and paler on the under, with two, quite large, fringed bracts at the bases of the leaf-stalks, and two, small, fringed bracts on the flower-stems, half an inch below the flower. The flowers are scentless, measure less than half an inch across, and are pale-blue or almost white, with veins of dark blue on the lower petal and tufts of white, fuzzy hairs inside, at the base of the side petals, the spur purplish. This grows in mountain canyons, at a height of five thousand to nine thousand feet, and is very small at great altitudes.